As the beam is wide and shallow it should be checked for punching shear. OK <Concise FC2 Table 15. In this case, at the perimeter of the column, it is assumed that the strut angle is 45°, i.e. that cot 0 = 1.0. In other cases, where cot 0 < 1.0, vRdmax is available from Concise FC2 Table 15.7. 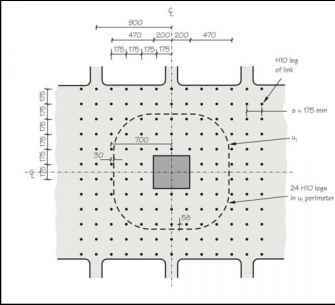 Why punching shear check at 2d from face of column?